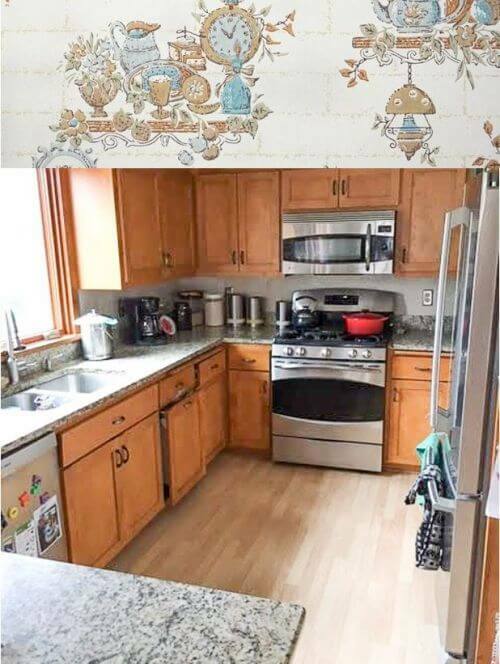 Readers Kate and Tom recently asked how to approach a Retro Renovation of their 1960s kitchen — which was updated by previous owners in 1990s style — with an eye toward being thrifty especially given potential resale in the future. I gave time for other readers to pipe in, and now it’s my turn. In this story, I point to research that underscores why you don’t typically get your money back on remodels — so beware, if you are not made of money… I spotlight reader comments that resonate with me… and I offer my advice for updates to Kate and Tom’s kitchen to give it a more retro look within the confines of the cabinet and countertop cards they’ve been dealt. 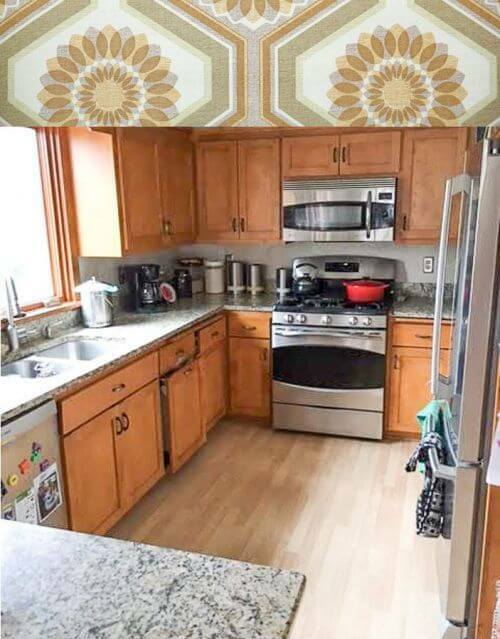 Above: Kitchen shown with 1960s vintage kitchen wallpaper from Hannah’s Treasures. Research suggests that you don’t typically get your money back on remodels — so beware !$!$! My story >> >> Remodel and watch your investment plunge in value <<. Short and sweet: Many — I see the research suggests 90% of — remodeling projects do not appear to fully return the money you spent on the projects when you sell your house. Read my story, and the links to all the primary source information, and you decide. If you are “renovating for resale”, be aware of the risks. If you are renovating to make the house your own — as a discretionary spend — well, that’s a whole ‘nother thing; for sure, over my lifetime, I have spent lots and lots of money on my houses that I did not, or doubt I will ever, recoup upon resale. 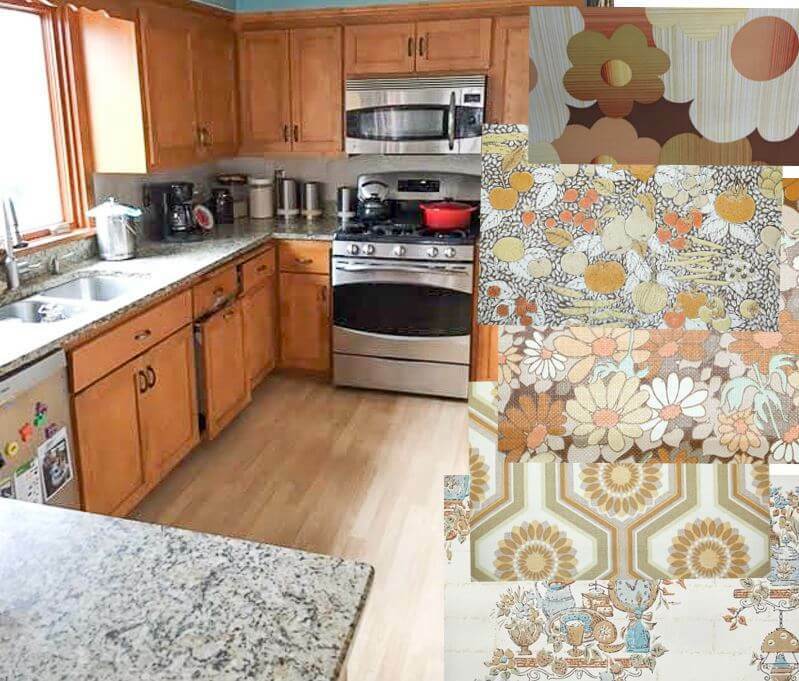 Above: Kitchen shown with 1960s floral wallpaper from Hannah’s Treasures. Note, here is a link to 2017 info, and I also see there is a map that shows regions where there is a better — even 100% ! — projected return on investment — and there’s a discussion of why favorite rooms like kitchens and baths do so poorly at recoving costs on resale. 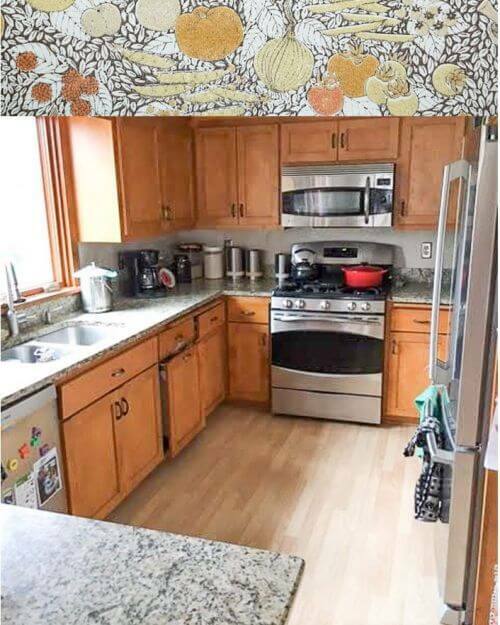 Beware the trendy: Relatedly, I wanted to feature Kate and Tom’s kitchen for another reason: It shows how massiviely popular design features from one era can relatively quickly become unfashionable and “dated”. The case in point in this kitchen: Granite countertops. Many readers, in the comments, pointed to the gray speckled granite countertops at “screaming 1990s”, and I agree. Now, though, granite is “out”, and quartz countertops are decisively “in.” Some readers recommended swapping the granite for quartz. I would not do so. Who knows how long quartz counter tops will be in style? One of the things I also recall reading from the remodeling survey is that the changes made, and valued, were for spaces that would be sold immediately. This suggests that, if you are in a “hot” area of the country where such investments are likely to recoup top dollar, you should make the investments shortly before you plan to sell so that what you choose is in style. Even then, be aware of the risks of not recovering your investment — spaces like kitchens and baths are so personal, in terms of what buyers want. Frankly, and this is coming from someone who is home shopping right now, don’t do anything but paint, curtains, and accessories, if you are trying to look retro. Why? 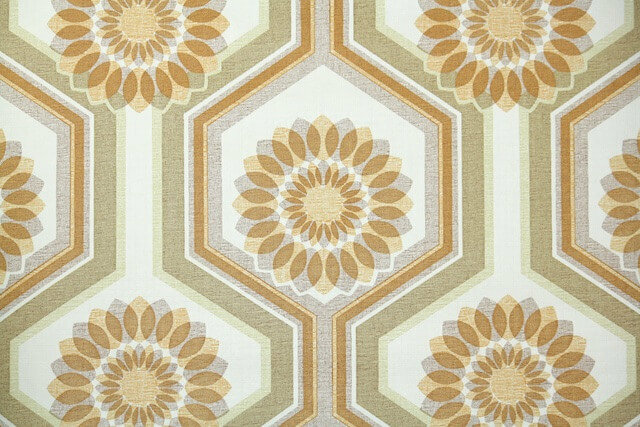 I love retro and would be jazzed to find an ultimate retro reno to buy. But in the perspective of the number of people shopping? I am unique. And I did say reno, because I want a smooth working kitchen. 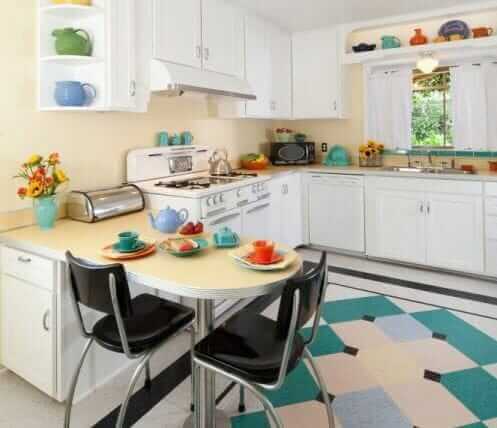 Not to mention the fact, that one persons cool 60’s reno is another person’s 60’s reno dud. If you’re not planning on making this your forever home, keep the big ticket and time consuming items off the menu unless they are timeless choices. Good luck ???? “Timeless” choices? See my story on the topic here. ….It sounds like you are not thinking you will always stay in this house. Do what you can with inexpensive changes and use your big money for things you can take with you, or save it to make your next house a reality sooner. My last house was built by someone with a 1982 country-kitchen sensibility. We changed out the corn-flower blue cutsey-rooster wallpaper and painted, but left the oak cabinets which were the opposite of our taste but well-built and in good shape. The house had other things we loved with young kids at the time: a big fenced yard, a great neighborhood, 5 bedrooms, and a big finished basement for them to play in. We just thought of those when the things we couldn’t change bugged us. We saved our money and bought land to build a house much more suited to our style. The other house sold to the first family that looked at it! Based on my understanding of the research, my approach would be that … if your goal is thrift and building your personal savings and net worth… and if your kitchen already is in safe (Be Safe/Renovate Safe!) and quality shape… and if you think you’ll be selling the house, especially sooner rather than later… spend as little as possible on changes. Yes: Keep the serviceable granite countertops, wood cabinets, appliances, and floor — and decorate around them. 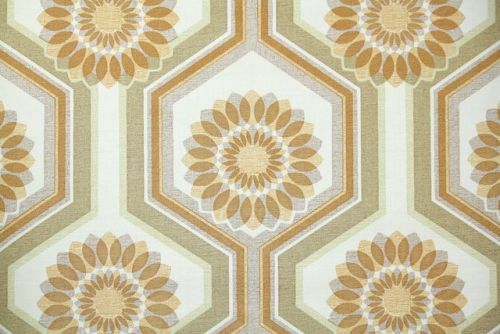 My go-to ways to retro-pep things up: Add vintage or retro-style wallpaper and window treatments, along with color-cued accessories that you love and can take to your next house. When you prepare to sell your home, either leave the wallpaper up if you think buyers might like the retro look, or, because wallpaper is such a personal choice, take it down and repaint in a neutral palette that will enable prospective buyers to imagine themselves in your space. 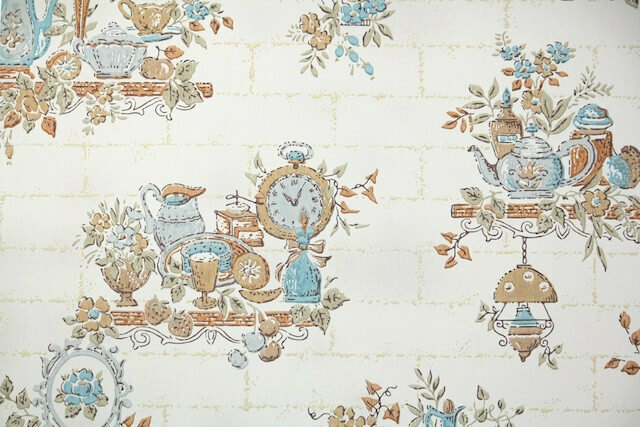 Above: The kitchen shown with 1970s wallpaper from Hannah’s Treasures. 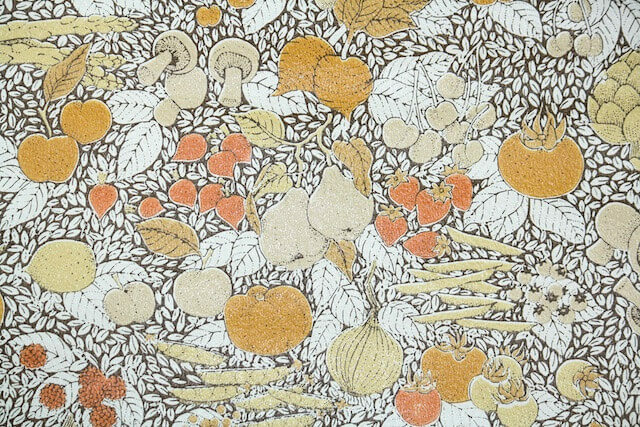 This wallpaper is my favorite in the orange family (so far) for your kitchen — although I would surely get lots of samples and torture over the decision. It has the brown and gray bases in tones that you need, PLUS and accents of dark coral and light minty-blue that you can play with. It also appears to be a nice scale for a soffit. My approach also means: Love the Colors You’re In. In this case, you’ve been dealt orange-blonde woodtones and gray. 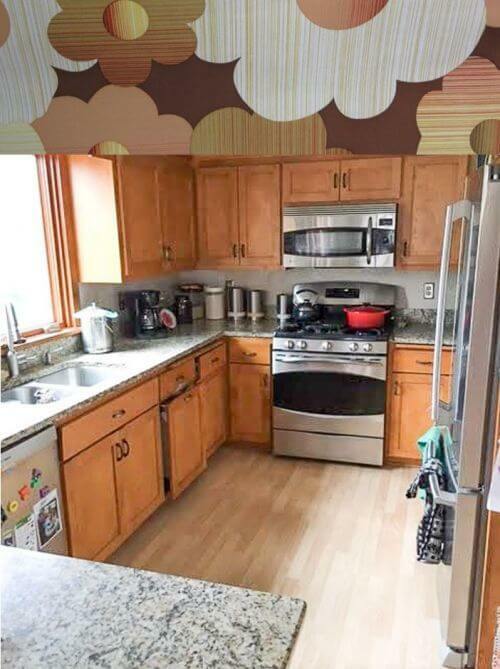 I am not 100% sure, but I think your wood is “warm” while your grays are “cool” — causing visual clash in this kitchen. 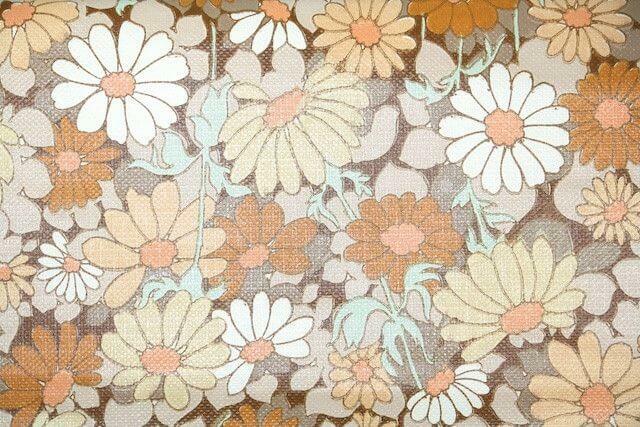 Above: 1960s-70s muted flower-power wallpaper from whatabagain8 on ebay — five rolls for under $100! Find a wallpaper that includes the wood color, the gray, and a third and/fourth accent color that you can play up elsewhere in the kitchen. The scale of the wallpaper designed for your narrow soffit space should be not too big, not too small, just right. Wallpaper the soffit, at minimum. In my kitchen, I also wallpapered an adjacent wall. I think I’d paint the backslash a gray color that is harmonious with but probably a bit lighter than the countertops — “neutralize” it — gray paint will make the backsplash recede. And, even though it sounds counterintuitive, a gray-painted backsplash may even play down the gray granite countertops, because you will see less contrast (compared to the current gray countertop + white backsplash contrast). I also like the look of these colors in your kitchen. The blue is opposite orange on the color wheel, so works, and the white feel has an airiness to it. I worry about the scale of this print, though: How much of it will show on a soffit? And, it might be too faint: You need the right measure of visual strength in the pattern to balance the expanse of cabinets and granite. You could also put the wallpaper — or a coordinating wallpaper — on the backsplash. But that’s a super in your face retro look. Are you game? See: Ben Sander’s kitchen transformation; he coordinated the wallpaper with the backsplash using tile, but you get the drift — you can do this look with wallpaper on the backsplash too. Start collecting accessories in your accent colors. For example, I see that burnt orange Le Creuset. If your wallpaper has that color in it, you are on your way! even paint can be a problem. unless you go with a very classic neutral. clean almost plain cabinets and and appliances are the necessities. 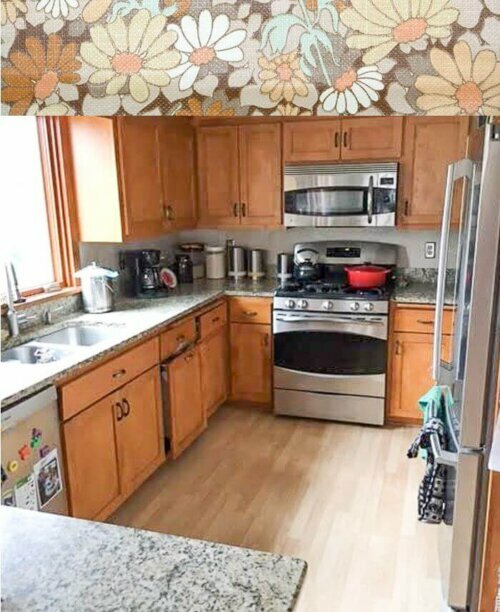 Do your self a great favor and DECORATE your kitchen in the sixties designs with all the REMOVABLE items.. the kitchy fun and period appropriate counter top appliances towels paper towel holders etc.,. then the day you decide to sell. PACK THEM UP nice and neat and ready for your next home and STAGE that kitchen back to neutral with only a few simple items of popped color..
just my thoughts and i wish you best of luck in your endeavors. I would leave the cabinets, floors and appliances alone. Those would be expensive to replace. My house is in the same situation as yours and I’m glad I didn’t redo everything now I worked with what I had and I’m very happy with it now. Things you can do to get a retro vibe would be to repaint, add a rug, change the drawer pulls, add some retro light fixtures and curtains, and just accessorize the heck out of it. Luckily most of what is there is pretty neutral and you can work with it. You’ll be glad you didn’t redo everything later on and then you can spend your money on other things. Plus you sound like you’re not going to be staying there for good. I say love the house you are in, and sometimes that means living with what previous owners have done if it is in good shape and functions well. My house was built in the 70’s but the kitchen underwent a stainless and granite transformation before we bought it. While it doesn’t entirely mesh with the era, the granite chosen complements the original cabinets and is perfectly functional, so we’re keeping it. There are so many other ways to bring in the retro look without making it look like you are doing a set design for a period piece movie or TV show. Consider changing out hardware or accessories, do simple things that add to the character. In my opinion, the best rooms have a look that feels like it has evolved over time, not stuck in a time capsule. First off, what’s the budget and what are your diy skills? Secondly, you’re concern is resale, are you looking to move in one year? Two? Five? If its only a year or two, I wouldn’t bother with too much of anything. Cheap and short term: Change the cabinet hardware. Wallpaper the soffit and the backsplash. (At the very least the soffit ) Clear the counters and stove of the modern appliances. Find some vintage canisters, and do-dads such to replace them. Try to find a throw rug in a style and color to complement the aforementioned wallpaper for in front of the sink. Same goes for dish towels, tie in your colors. Ugh, I hate getting rid of things that are still fully functional. It’s a waste of money and bad for the environment. You can change the look totally by accessorizing. Change out the hardware to something chrome, add little 1/4 round plant/knick knack shelves on the cabinet at the window and sink, new hand towels, and decorate the soffit with a collection of plates, tiles, trays, or kitchenalia. Use the countertop to show off some vintage styled appliances, canisters and storage. A couple thoughts… gutting a perfectly usable kitchen (with a higher resale value than a retro one, even before you spend all the money to make it retro) is the kind of landfill-stuffing waste that is steadily destroying the planet. My .02: gut the moldy useless messes and get the full usable life out of the perfectly good spaces. If you’re really thorough and buy nice used stuff, and find homes for all the materials you take out, only then can you avoid becoming part of the problem. Or do lower-impact visual fixes like previous posters mention. I’ve asked the same question of my useless/freezing/horrid 1/2 bath as I turn it into a retro 1935 Ming Green full bath. All my efforts pay off for me, but it’s a dice throw on the next owner’s preference for modern or vintage. Yes, Matt: Will 1990s kitchens be Retro Renovation kitchens of the future? Surely, the best of the designs will! So it is with all eras. Yikes. This story took me, like, six hours to pull together, what with going through all the wallpaper options twice. But Kate and Tom, if I were in your place — which I have been! — I am sure it would take me much more time to map the game plan. Good luck! Let me know what you ultimately do! And: Thanks, readers, for all your comments! They were really good — and to be sure, they map out a continuum of ideas for Kate and Tom to consider based on (1) how much they’d like to spend to make this kitchen their own given (2) the time they plan to be in it. 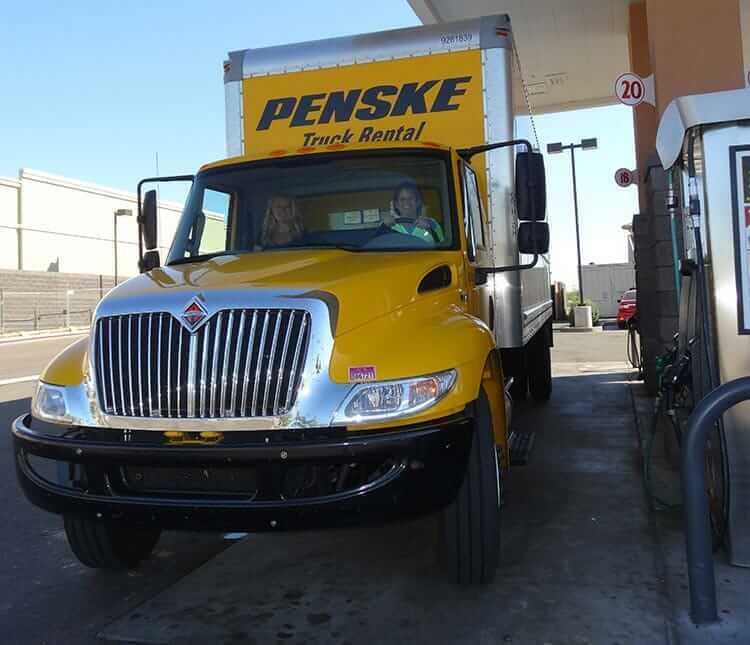 There were 156 comments to this story — take a look at them all here. 1. Cabinets can always be painted. That seems to be very popular these days. Painted cabinets can always be re-painted if someone doesn’t like them. 2. Not-every vintage retro component wears its age well. There are many that people look at and say “What the heck were they thinking?” In 50 years, people will be saying that about our infatuation with granite and stainless steel. 3. For this reason, choose elements and components that withstood the test of time. Just because something was used back then doesn’t mean it should be used today. 4. There re some things that I feel should never be used in a retro renovation. Those include stainless-steel appliances (with some exceptions) and solid-surface counter tops. 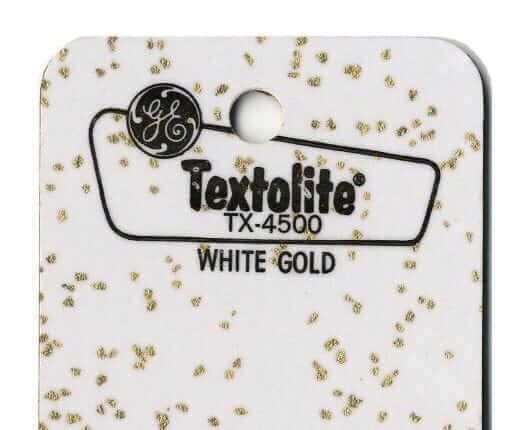 They simply weren’t used back then, and seldom impart an authentic retro feel. Use these if you must, but understand and accept this. Homes simply do not have to have these things in order to be serviceable, despite what HGTV preaches. 6. 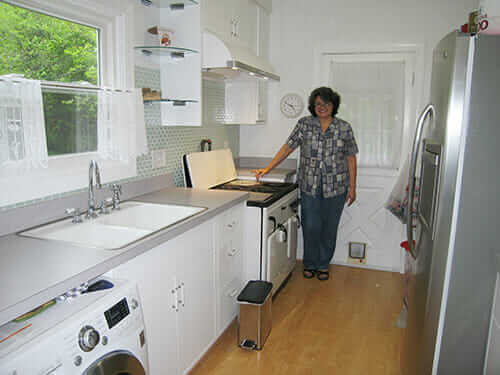 As Pam says, you will seldom, if ever, recoup the money you have put into a retro renovation. Do not approach the project as an “investment.” This is unlike other home improvements. 9. Follow common sense, as well as the time-tested design guidelines that have been listed here. 10. Your project will always cost more than you anticipated or think it should. You will have trouble finding contractors to help bring your project to fruition. Hi all!! My yabba dabba kitchen facelift sold my 1957 ranch in ONE day and $20k over the comps, $10k over asking!! Do what you love! Wow! Congrats! I hope that took the sting out of having to leave that yabba dabba wonderful kitchen!